Can’t find the right words to best promote your products? Leave it up to the word magicians at Phone Sound. Our copywriters specialise in writing copy for audio productions to be played in-store, and are sure to find the right words to engage with your customers while they shop or wait. Telephone Music and Messaging onhold is a great way to continue your branding and to inform your callers about the latest promotions, loyalty clubs and in-store specials in a creative and non-confronting way. Our copywriters have many years’ experience in writing scripts for audio, with backgrounds in broadcast and print journalism and marketing. 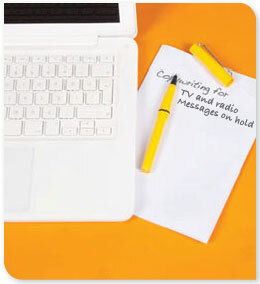 They will put pen to paper (figuratively speaking) and write mini-radio commercial scripts to entice your customers to purchase, and to educate them about your services. Our voiceover artists will then bring your script to life with their acting abilities, and our audio editors will add their magic to make a captivating audio production. With well written audio messages that get straight to the point, are clear and concise and are informative will get your customers asking the right questions, and make your business sound more professional.